Rustic soul gem texture originally by Gamwich, prepped for MLP shader by MadCat221. Moved a Skyshard that had its beacon sticking out beneath a rock. A beacon on another Skyshard was not correctly linked to disable when the Skyshard was activated. A Skyshard was being disabled instead of the aura linked to it. Note: These fixes will not take effect on Skyshards that have already been activated. Skyshards that have not been discovered yet will now emit a humming sound. Due to limitations on how sound works in the game you may still need to be fairly close to one to hear it. When touching a Skyshard, a new visual effect and sound will play. Gone is the uneventful thunderclap. 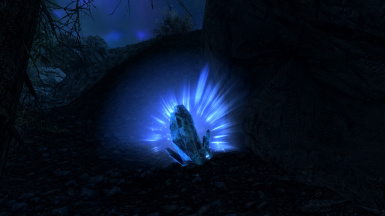 Selected outdoor Skyshards will now have a highly visible blue beacon over them. Since the beacon object ignores collision it will not be found on shards which are covered by something outside, and shards indoors will have no beacons on them. 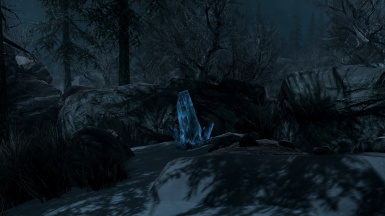 Beacons will not be visible from a distance, which conforms to their behavior in ESO. Renamed the script to make SSE let go of the old copy that became broken when the exploit was plugged. Upgraded the Skyshard textures to a higher resolution to fit the scaled up gem size. Thanks again to MadCat221 for these! Fixed an exploit in the shard activation script that would let you get credit for more than one at a time. Long ago, during the second era in the time of the Planemeld, adventurers sought out whatever power they could gain to aid in their battle against Molag Bal. 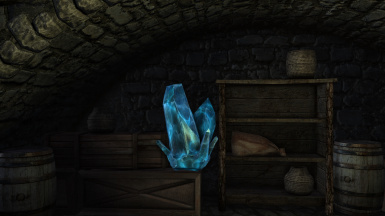 Among these items of power were Skyshards, presumably made available by the gods for those who were dedicated to exploring both the hidden and mundane corners of Tamriel. 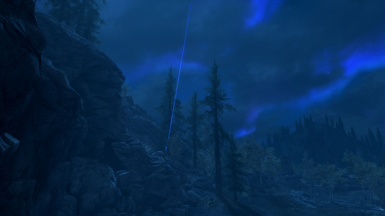 Not much is truly known about them, but in these trying times of dragons and civil war, the Skyshards have once again appeared for the Last Dragonborn to discover and augment his power. 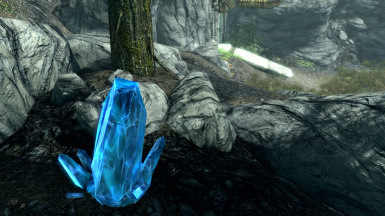 ESO Skyshards places several shards throughout the province of Skyrim, including Dawnguard areas and Solstheim. Much like the ones from ESO itself, once you collect 3, you will earn 1 perk point to spend as you see fit. There are 6 in each section, for a total of 66 shards amounting to 22 extra perk points. That may seem like a lot, but by the time you've found them all you'll likely be pretty high level anyway so it balances out in the end. Sorry, beyond the 3 screenshots displayed for the mod, I will not reveal the locations of all of the shards. They do not have map markers either, and there are no plans to provide any. They are located in a mix of easy areas and hard areas so they should prove to be quite a challenge to locate. This mod will go especially well with mods that expand the number of perks you can use as well as perk overhauls that expand the number of points required to obtain perks. This mod requires external assets and is therefore not possible to port to PS4. Sorry. Drop the Skyshards.esp, Skyshards.bsa, and Skyshards - Textures.bsa files into your Data folder. To remove the mod: Delete the Skyshards.esp, Skyshards.bsa, and Skyshards - Textures.bsa from your Data folder. Then reload your game as usual.